They are a great way to travel. Demand for trains is surging. Amtrak ridership has spiked in the last decade, and it would grow even faster if there were more trains. Why? Because trains solve all the headaches of driving and flying. They’re more convenient, more eco-friendly, and unbeatable in terms of time, money, and connections. The Midwest is really spread out. We regularly travel hundreds of miles for important meetings or events, or simply to spend time with friends and family. 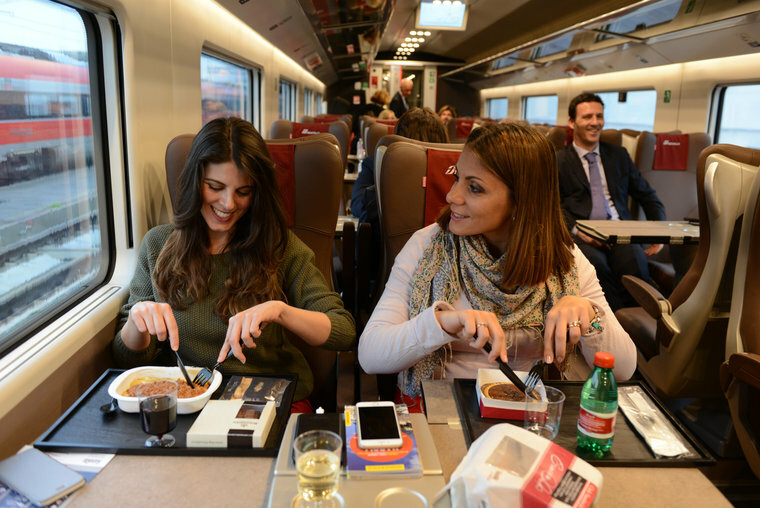 High-speed trains can make those trips more frequent, more enjoyable and more affordable. Don’t you wish you could take a train? 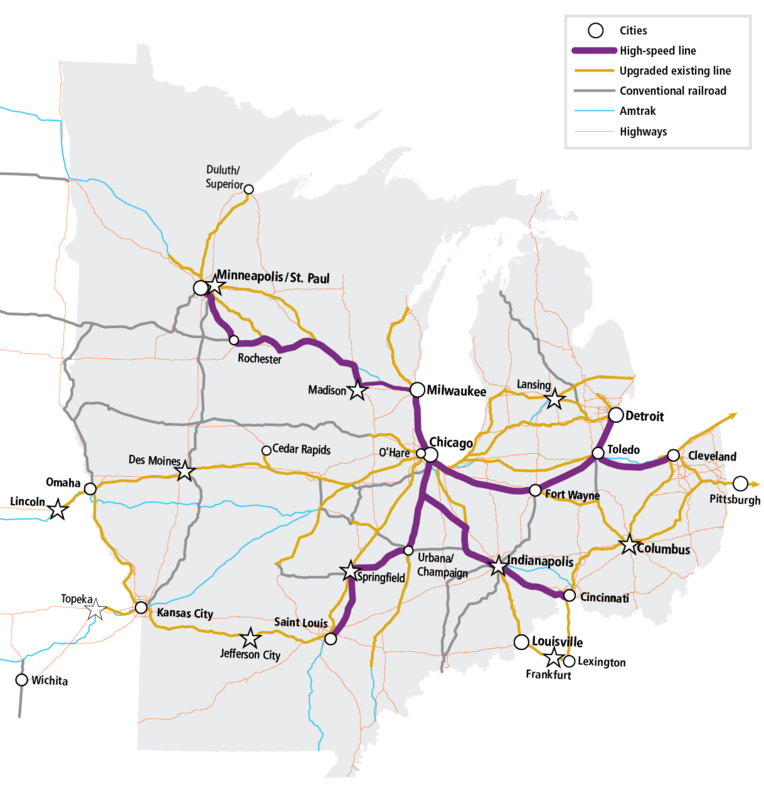 In this example of a 400 mile trip from Chicago to St. Paul a high-speed train would be less than half the time and cost of driving. 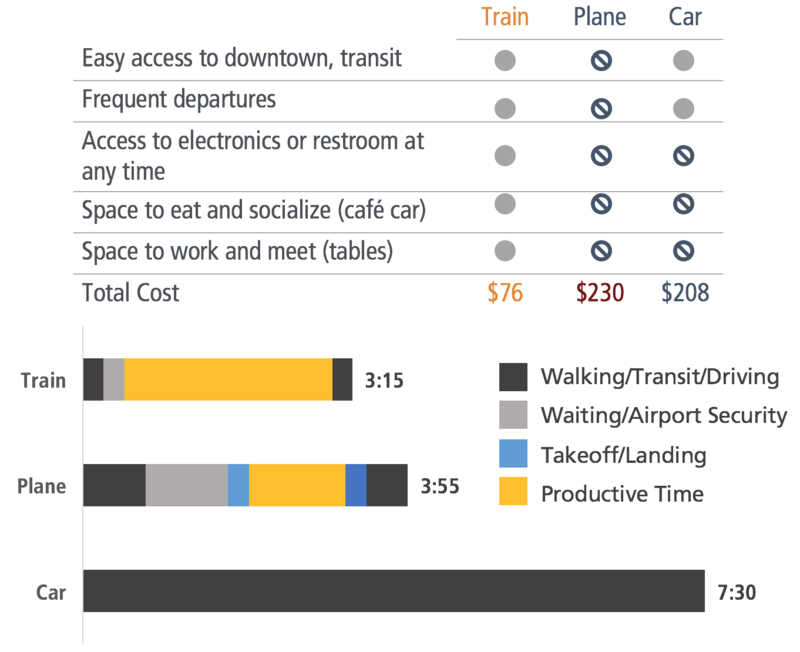 It would also be half the cost of flying, and still faster, when you factor in all the wasted time. Trains are the smart, fast way to travel. Imagine it. High-speed trains could zip from Chicago to Minneapolis more than twice as fast as a car—2.5 hours vs. 7.5 hours. With airport delays factored in, they would beat flight times by more than half an hour. The best-kept secret about trains is that they're fun. Your time is your time. You can work, eat, have a drink, daydream, socialize, take a nap—whatever. It’s your call. 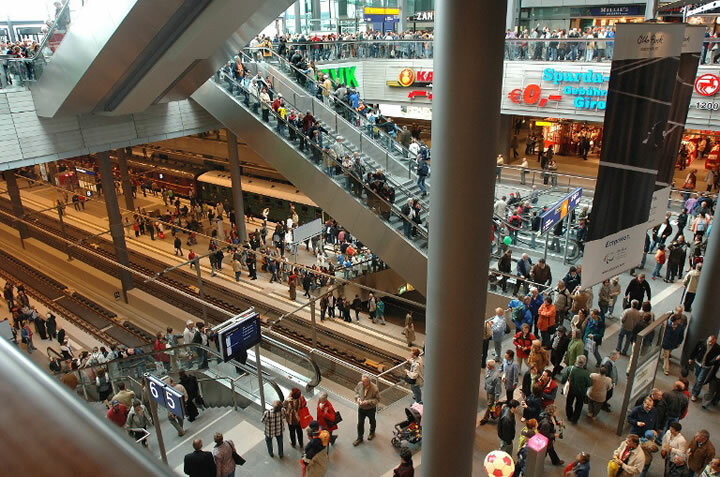 Trains depart more often than planes, so there's no waiting for hours in a terminal. They blast through rush hour and bypass traffic delays. The trip from Chicago to Minneapolis wouldn’t just be faster on a high-speed train. It would be cheaper. A lot cheaper. About $75, versus more than $200 to fly or drive. Four new high-speed lines radiating from Chicago form the core of a Midwest high-speed rail network. Low ticket prices are just the start. A high-speed rail network would be a massive economic boost to the region, creating nearly 130,000 long-term jobs. Building the network alone would sustain more than 60,000 good-paying jobs each year for at least a decade. 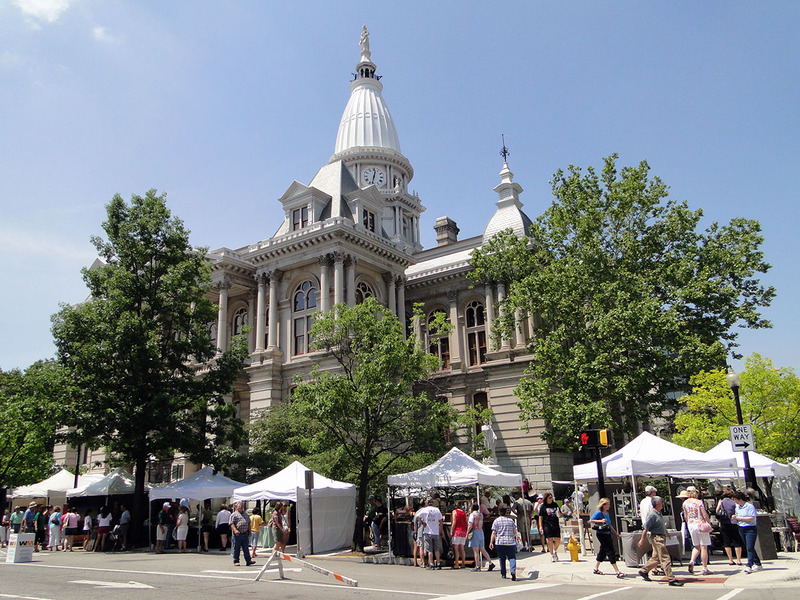 Fort Wayne, Indiana, which was last served by passenger rail in 1990, could see 900,000 passengers per year, boosting its economy by about 2 percent. The regional base of 30,000 jobs in LaCrosse, Wisconsin, would grow by nearly 1,000. The number of rail passengers coming through downtown Lafayette, Indiana, would skyrocket—from 19,000 to 300,000 each year. The Midwest is the rail capital of the nation. High-speed rail builds on one of our great assets, binding scattered towns and cities into a unified region. For example, Amtrak now stops at about 200 stations in the Midwest—but many small towns are served by just one train a day. So a car is the only way to get around. Forging new partnerships with the railroads to add multiple daily departures to these existing routes and filling in network gaps will build upon this strong foundation to reconnect our cities and towns. Adding well-placed segments of 220-mph high-speed line will draw everyone closer together. A high-speed rail network will make the entire region more accessible—all the colleges and universities, all the cultural and tourist sites, all the big and mid-sized cities. And that means access for all to O’Hare, which offers more international destinations than all the airports in the Midwest combined. O’Hare should be the gateway to the world for people from LaCrosse and Madison to Lafayette and Indianapolis, and far beyond. When the network is in place, it will be. A Midwest high-speed rail network would bring activity to our cities and towns, like Lafayette, Indiana, which would see the number of passengers at and around its train station grow 15 times over. Photo by Karen Demerly (flickr cc). Our national politics is gridlocked, and it’s hard to imagine how we can come together, find common ground, and create positive, revolutionary change. High-speed rail is an answer to all of that.It connects people. It will forge the Midwest into an economic dynamo. It has bipartisan appeal. And it can be our reality. In a word, it’s doable. With your support, the future is here. Help us make high-speed rail a reality.